Many years ago my neighbor put up a 6 ft. fence on the property line between our houses. At first I wasn’t sure how to feel about it. I tried not to be offended but I have to admit that I was…just a little. I soon got over it though when I realized it was the perfect spot for a fence row garden. I wasn’t sure how to plant a fence row garden but I was determined to find out. I knew when I started planning that I wanted blooms. Lots and lots of blooms. I also knew I was going with all perennials. I wanted to plant something once and see it come up year after year. Well…it’s been a process for sure. Honestly, I’ve had more things die than have lived. But with each passing of some poor plant, I learned something. I either watered too much or not enough. It got too much sun or too much shade. Over the years, after quite a bit of trial and error, I now have what can be called a real garden. 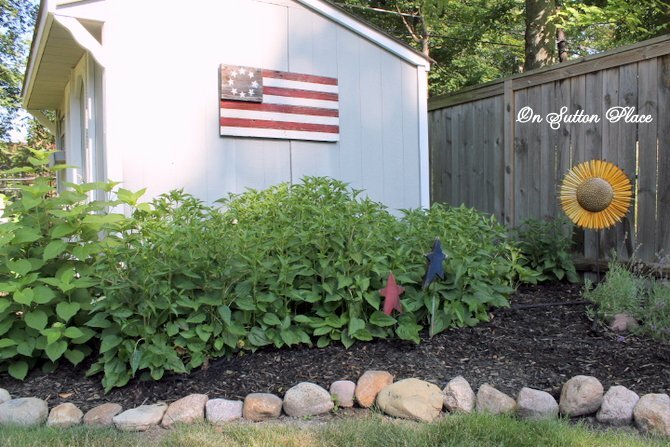 The plants I chose are mainly tried and true all American favorites. Black-eyed Susans, Lavender, Peonies, Daisies, Phlox, Coreopsis, Sedum and of course the queen of all blooming plants, Hydrangeas. I began by marking a curvy line several feet from the fence and laying field stones as a border. This took a couple of years. I got the first load of field stones from a co-worker for free. It wasn’t quite enough so the next summer I actually bought some stones to finish the border. I vividly remember thinking to myself that I was surely nuts to be paying money for rocks. Nuts or not, I had my border finished! Next was a few loads of good soil and some compost. The first plants went in at the end of the summer in 1999. Before I planted my garden, I wasn’t a big fan of the shed. After the first few years, when the plants started maturing, the shed actually began to make sense. Instead of an eye-sore, it became part of the garden. 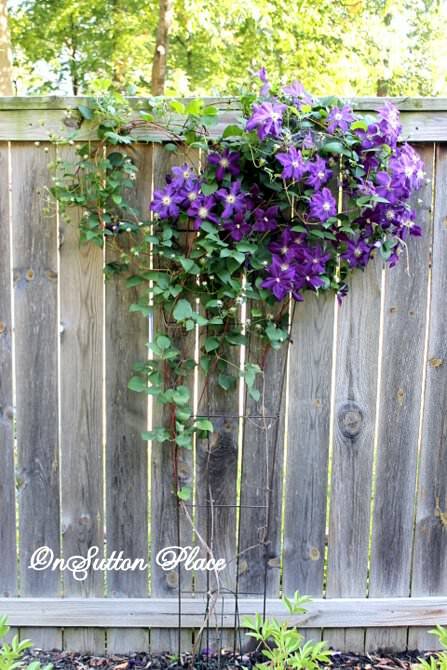 One mistake I made at the beginning was neglecting to plant any climbing, flowering vines. I’m fairly certain that back then I didn’t even know what climatis was! I’ve added bittersweet and a purple clematis and both have done pretty well. The two plants I can depend on to bloom year after year, no matter what, are this coreopsis and the black-eyed Susans. 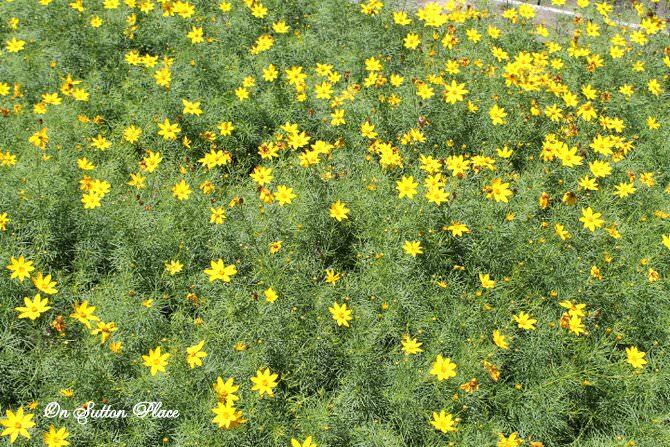 From 3 small plants I now have a bed of coreopsis that measures at least 4 ft. x 6 ft. The black-eyed Susans had their best year ever last summer. I’m certain it was a result of laying soaker hose through out the garden before I mulched. Amazing what a little water can do! I follow the same philosophy in my garden as I do when I decorate my home. If I like something, I make it work. I don’t want a plant in my garden that I don’t absolutely love. I’m not big on pruning so I have nothing that needs cut back regularly. The soaker hose made life much easier by eliminating the chore of daily watering. Standing out there with a hose is just not my idea of fun! Almost 15 years of toil and sweat has produced a little fence row garden I am proud of. I know the day will come when I have to leave this house. Of all the things I love about living here, my back yard and fence row garden are by far what I love the most. I hope the next owner will appreciate them and love them like I do. I miss my coreopsis. This was there 2nd year. I had a few die off actually. I need vines on my fence. We have a similar fence to block a neighbor who grew weeds like ragweed. I have my herbs there but its all green. Ann, did you make your own rock or buy them? There is one blog owner who makes her own rocks, mixes the mortar in a plastic bag like you get with a small purchase, forms it into the shape she wants and tucks the plastic bag under and lets it dry that way and in a few days she can remove the plastic bag and she has a rock to edge her flowerbeds. Can’t remember who the blogger was but it looked like something I’d like to try but no where to store the Sacrete mix, plus it’s heavy for a woman to lift. We bought ourselves one of those Keurig coffee makers where you buy the pods..so when a pod is finished, I take a knife or scissors and snip the foil top off and scoop out the coffee from the pod and put it in a plastic container. I add water when I get it almost full and shake it in the covered container jar, then pour it around my hydrangea and roses. In fact, I cut some hydrangeas from my yard today and they are so pretty. In addition to the hydrangeas, I cut some Prairie Sun rudbeckia and put them in a clear vase in the main bathroom. We had company today and they complimented me on such bright daisies(aka Prairie Sun Rudbeckias), I also bought in the most beautiful two tone purple gladiola that I grew also. Earlier this week the glads I bought inside were a beautiful fuschia color. They grew so tall, 5 ft. easy. The one I bought in today only grew to about 26-30 in. if that tall. I think I bought those glad bulbs in a box from Big Lots 2 years ago..what a bargain! The coneflowers are starting to bloom as are the daylilies, monada have been in full bloom for a few weeks, as have the shasta daisies. Coreopsis is one of my favorite perennials too..no care but sheer them back if they get too lanky and they’ll come back as beautiful as ever in about a month(my guess of time). I have the Zagreb variety and love it. What do you feed your clemais and when? Oh, your lovely garden is a true delight! The rocks add such a nice touch. I have an English friend who told me she puts her used teabags around the base of her hydrangeas – she opens them up, and lightly scratches in the tea leaves to get beautiful blooms. 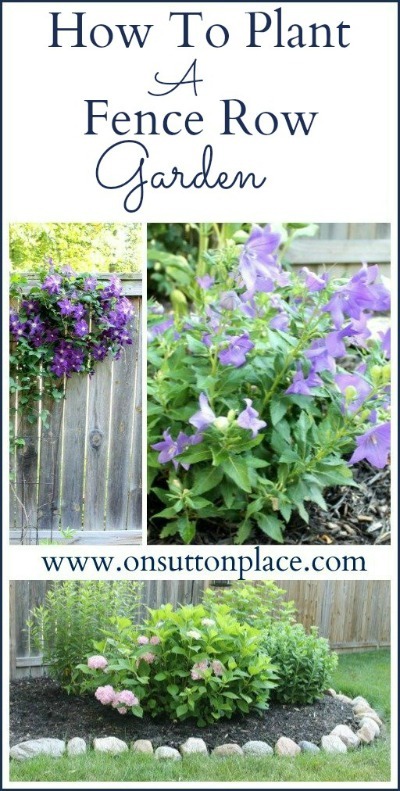 I am definitely going to try this – I can’t even get my Endless Summers to bloom! 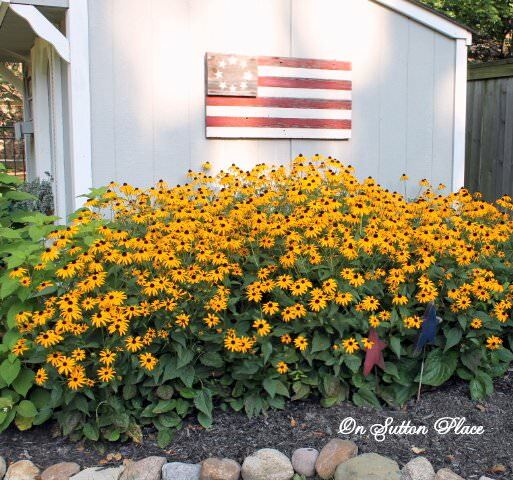 Love the garden images…but its the one of the black eyed susans that just got me. Reminds me of my childhood summer times. Ahh…. I love it. So beautiful and the shed is darling. Test, test… It’s working, Ann! Yay! Did you get an email with my reply? I didn’t. Do you have a plugin installed for it? That’s just beautiful Ann…I love the purple climates and the pretty stone border, so pretty! Gorgeous! We have a back yard full of fence that is just begging for a garden like yours! Pinned for when we tackle that challenge! Hi Ann, Your fence row garden is really beautiful, I love the curvy lines of it and the little shed is very pretty, too. I have always wanted a garden like that. I have pinned it because one day I will need it! Gorgeous! I love black eyed susans and your climatis looks so pretty! Great job Ann – you have a great green thumb! Totally gorgeous backyard!! Love your plantings. 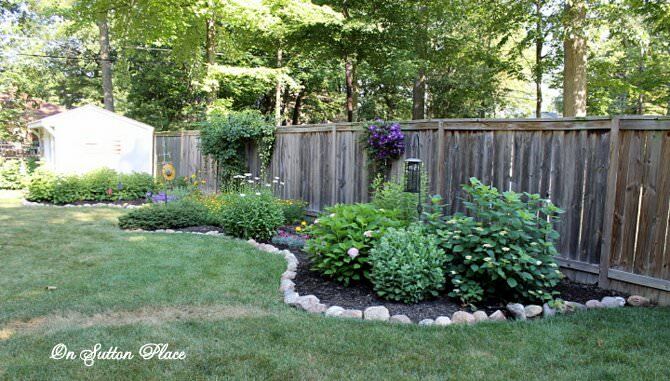 Your fence garden is gorgeous! I am partial to the black-eyed Susans, even though I don’t have any in my garden. I will have to plant some this year because I love them so. One of my projects this year is to create a new bed, and I want to edge it with stones the way you did. Your back yard is beautiful! What a lovely, relaxing place! I have been working with my landscaping since we moved to this house. I think I have removed every plant that was here when we moved in. It is still a work in progress… But yours is beautiful! Your garden looks lovely! I think it was the perfect thing to soften that fence. Good for you, Ann- it looks great. And it DOES take time, effort and energy.,…and let’s face it – we’ve had a couple of very rough summers, which is havoc to a young garden. Something else hydrangeas love is a mulch root bed of pine needles. I have very prolific blooms on my hydrangeas (about 8 of 3 different varieties) every year here in Texas. I never cut them back (and they aren’t that pretty in winter). I just cut back the dead stems in early spring that don’t seem to be leafing out. I plant them on a protected northeast side of my home. They love morning sun and afternoon shade. Your garden is lovely! :D It gets so hot here in the summer, I’m depending on succulents more and more. We can leave for a weekend and come home to dried-up dead plants! We have a sprinkler system, but it’s like you said….some things don’t need as much water. How lovely! The shed looks like it really belongs there, sort of like a “secret place in the garden. Your choice of flowers is perfect. The fence makes a perfect backdrop for the yard. Good job! 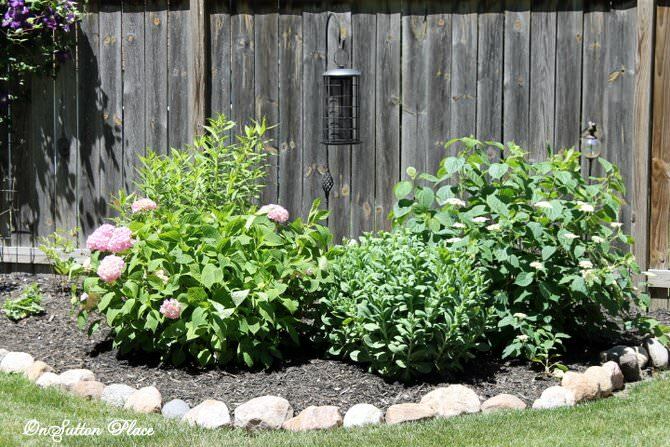 Ann – pretty, pretty fence row garden! Looks beautiful! Your garden shows it has been handled with love! so beautiful … you have to be proud! Thanks for sharing. Oh Ann, I love your garden and the shed too! The last picture is georgous with everything including those beautiful trees! The picture of Springtime! Your flower garden is really striking! I love it. It looks just like a cottage garden. You’re so lucky to have such mature flowers now. Patience paid off. Don’t be offended by your neighbors putting up a fence. They say fences make good neighbors! My neighbors just recently put one up and we couldn’t be happier! It adds visual appeal to both of our yards and keeps their dogs in and our dog out. Perfect!! I told my husband that one day we may want to take advantage of it and plant something near it (like you did). It really adds so much to a yard. Your garden looks beautiful! I love the black- eyed Susans. We finally put down soaker hoses a couple of summers ago, and boy, it’s been so much easier to water that way! When we had a drought, we put them along our foundation and watered that way to (hopefully) avoid any cracks in the foundation. Your garden is lovely. The coreopsis is really looking good. I love hydrangeas, but haven’t tried my hand at them. 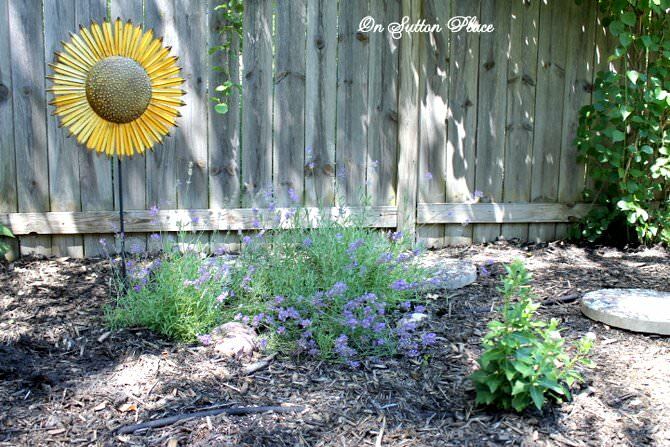 This post is so timely as I’m just getting started in my backyard and trying to decide what to plant along the fence. I just planted a climbing vine in the backyard yesterday. It takes me years to complete garden plans too. By the time I left my first house, where I’d created a lovely backyard over the years, I hated leaving those plants behind! So, I completely empathize with your feelings. Your fence row garden is lovely Ann. I am in the process of fixing up some beds that were left unattended for 2 years. I hope they turn out as lovely as your garden. Ann that looks gorgeous! Well done indeed. Your grass is so green too. Love it Ann! Especially your stone border and how you’ve decorated the side of your barn! Your garden is beautiful! I love the coreopsis. I just planted several. I hope mine turns out as beautiful as yours. Hi Ann, I love your fence row garden. I think you did a beautiful job selecting the colors and flowers. I love and have climbing roses on my fence. I think the shed looks great, I love it has it’s own flower beds and the black-eyed Susans are gorgeous. Lovely……. Your garden is so beautiful, Ann. I’m like you…if a plant isn’t working for me, I take it out and replace it. What a wonderful view you have to look at out your back windows. Your garden looks fantastic. That is a great idea to leave a drip hose buried under the mulch. I presume you just keep the hose attached too so you only have to turn the tap on. I love your shed and wish I had one. Such a beautiful garden you’ve created! I am working on a small make-over in my garden this year, so I can appreciate the sweat and tears that go into it. What kind of hydrangea do you have? I have an Annabelle Hydrangea that all but goes neglected and it produces big plate size heads. LOL! Maybe an Annabelle would work for you. In any event, enjoy the fruits of your labor this summer. You deserve it! I saw this post on Pinterest & came on over to have a look. 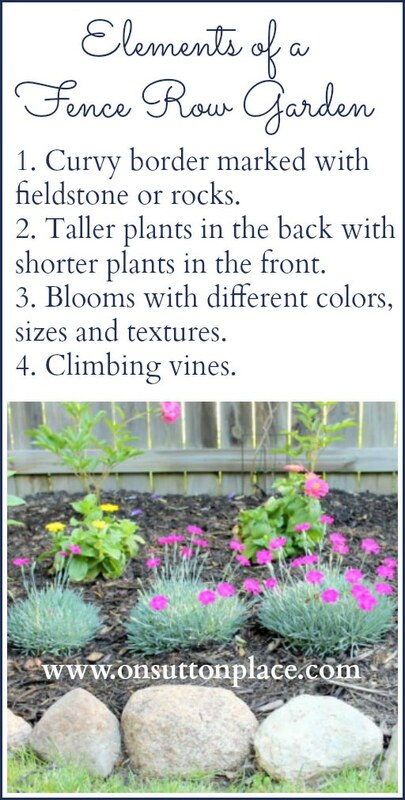 I love your tips & I’m going to be using them this summer on my fence garden. It’s a beautiful garden! I was going to say try coffee grounds. But I can’t get them to grow, much less bloom. I’m hoping for better luck this year too. 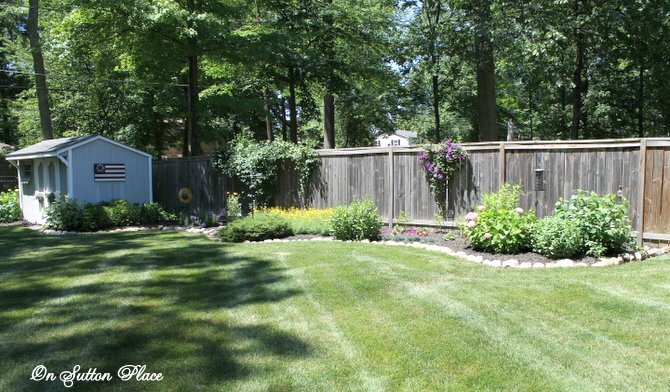 What a great garden…and a nice neighbor to build a fence to use as a backdrop to your garden. :) Your shed looks really pretty, too, with the black eyed Susans beside it, and I like your choice of plants. Great job!